The term “superfood” has been bandied about quite a bit recently. But if there is one food that truly deserves the moniker, it’s the mighty coconut. This is because in the past decade or so, the supposed dangers of saturated fats have been seriously called into question (for more on this, see “A Big Fat Mistake“). Meanwhile, recent research has also revealed that most of the saturated fat found in coconuts — lauric acid — is a medium-chain triglyceride (MCT), a type of fat particularly coveted for its health and fitness benefits. 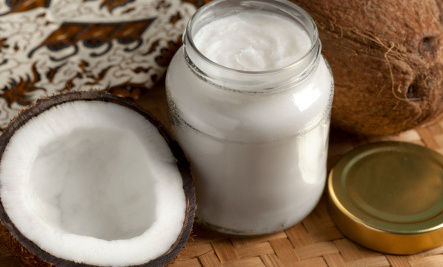 In studies on rats, virgin coconut oil has been shown to reduce blood serum levels of LDL (“bad”) cholesterol while raising HDL (“good”) cholesterol. It also appears to help blood coagulation and improve antioxidant status. Nutritionists say MCTs can also play a key role in higher-fat, lower-carb diets, which seem to help epilepsy, cancer, and Alzheimer’s patients. Organic, extra-virgin coconut oil — the gold standard in terms of flavor and nutrition — also has rich anti-inflammatory, antifungal, antiviral, and antimicrobial properties. Plus, it serves an amazing number of non-edible purposes. In coconut-loving Malaysia, the word for coconut tree translates as “the tree of a thousand uses.” Here are just a few. Mix a little baking soda with coconut oil for a quick homemade tooth polish. The natural analgesic properties of virgin coconut oil can help take some of the sting out of bug bites, chicken pox, and poison ivy, and aid skin in healing faster. Coconut oil is also a natural sunburn soother. Massage your hair and scalp with coconut oil prior to shampooing to promote hair health. Use as an all-over body moisturizer to smooth dry skin and add sheen. Slather on after your shower, or try adding a few tablespoons to your bath. Great as massage oil, too. Use as a shaving cream — great for chemically sensitive folks. New parents use coconut oil to help combat diaper rash. Not only does it sooth a baby’s bum, it also contains antibacterial agents that fight infection and promote healing. Consider taking coconut oil as a supportive treatment in preventing and fighting systemic fungal conditions, including athlete’s foot and vaginal yeast infections. The oil’s caprylic acid helps degrade the cellular membrane of theCandida albicans fungus, limiting its ability to colonize. To help relieve seasonal allergy discomfort and itch, try rubbing a little oil in your nostrils. It’s also a good immune-system booster and a strong anti-inflammatory, both of which can help ease allergy symptoms. For earaches, melt a little bit of coconut oil, cool to room temperature, place in an eyedropper, and put several drops in the affected ear. The oil’s antimicrobial qualities can help fight low-grade infections. Anti-inflammatory coconut oil can help canker sores and cold sores heal faster. Allow a tablespoon of coconut oil to melt in your mouth, then swish it around for 10, ideally 20, minutes to draw out impurities and moisturize oral tissue. Then spit it out and rinse with water. Known as “oil pulling,” this ancient practice has grown increasingly popular in recent years. Research has shown it effectively combats bad breath and plaque. Try coconut oil as an acne preventive. A 2009 study found that lauric acid can kill the bacteria that promote inflammatory acne. Rub a bit onto vulnerable areas. Season your cast-iron pan with solidified coconut oil. Coat interior surface, then let the pan sit in a 300-degree-F oven for 20 minutes. Create a quick furniture polish by mixing 3/4 teaspoon coconut oil and 1/4 cup lemon juice. First remove dust, then rub in coconut mixture with a clean, soft cloth, and buff to a gleaming shine. Combine 1/4 cup of coconut oil with 20 drops of citronella oil for a nontoxic bug repellent. Gum in your hair? Unknown sticky substance on the couch? Combine coconut oil with baking soda and rub. Leesa recommends using organic coconut oil! By Sheila Mulrooney Eldred, Experience Life.